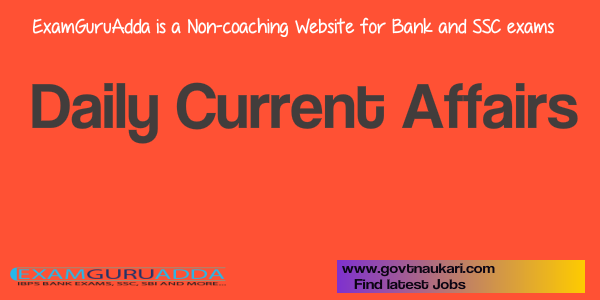 Dear Readers, we are presenting Today Current Affairs for All Exams- 14th April 2017. Daily Current Affairs and General Knowledge is very helpful for IBPS Bank Exams, SBI , RBI Assistant,NIACL, SSC and Railway Exams. 1. 127th birth anniversary of Bharat Ratna Dr. B.R.Ambedkar was celebrated at the Parliament House complex. 2. The President, Vice President and Prime Minister paid floral tributes to the statue of Ambedkar present in the Parliament House Lawns. The celebrations were organized by Dr. Ambedkar Foundation, Ministry of Social Justice & Empowerment. 1The United States dropped a massive GBU-43 bomb, the largest . non-nuclear bomb it has ever used in combat, in eastern Afghanistan against a series of caves used by Islamic State militants. 2. Also known as the “mother of all bombs,” the GBU-43 is a 21,600 pound (9,797 kg) GPS-guided munition and was first tested in March 2003, just days before the start of the Iraq war. 1. The Income Tax department has launched the second phase of the ‘Operation Clean Money’ to investigate over 60,000 individuals with an aim to detect black money generation post demonetisation. 2. The Central Board of Direct Taxes (CBDT), the policy-making body of the income tax department has detected flow of black money into the banks amounting to over Rs 9,334 crore between November 9, 2016 and February 28 this year. 1. Loans disbursed under the Pradhan Mantri Mudra Yojana (PMMY) have crossed its target of Rs 1.8 lakh crore in the financial year 2016-17. Loans extended currently stands at Rs 1.80,087 crore. 2. Of this, a majority of the loans were awarded by banks (Rs 1.23 lakh crore). Non-banking financial institutions have lent about Rs 57,000 crore. In this year’s budget, Rs 2.44 lakh crore has been set as a target for Mudra loans for the financial year 2017-18. 1. Similar to that of Uttar Pradesh’s ‘anti-romeo squad’, the Haryana government has launched ‘Operation Durga’ to ensure women safety in the state. 2. Under this operation, teams formed by the Chief Minister’s Flying Squad visited public places such as schools, colleges, bus stands and railway stations and caught persons indulging in crime activities against women like eve-teasing, stalking, harassment and other such activities. 3. Since women are hesitant in reporting incidents involving anti-social elements to the Police, the campaign, ‘Operation Durga’ was launched so that flying squads patrol those areas where such anti-social elements committed crimes against women. 1. Amazon India has received the RBI’s approval for an e-wallet 'Amazon Pay', which the e-tailer had applied for early last year. 2. The licence has been issued to Amazon Online Distribution Services on March 22, 2017 and is valid for five years.